Lots of "little" guys came in this week, some winding up in the Orphan Care area, some in the ICU, and some in 'private rooms' due to the nature of their problems. 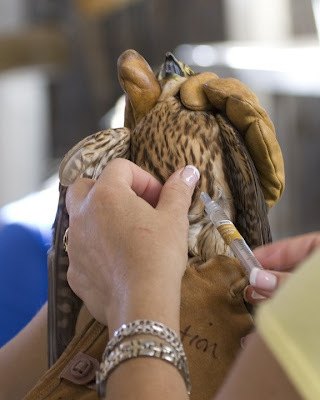 It was also the week that the Education birds got their annual West Nile Virus inoculations, as well as some periodic maintenance that we did at the same time. Even our long-term residents get the full treatment in order to stay healthy. The ubiquitous "LBB" (Little Brown Bird) baby gaper. Another baby gets some nourishment. Wrapping the tiniest of legs. 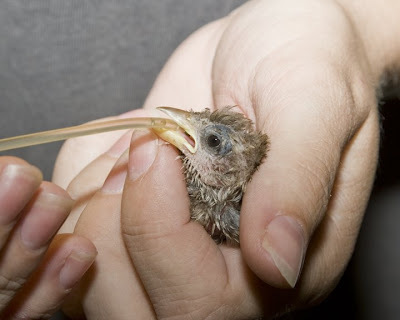 A baby white wing dove gets tubed. 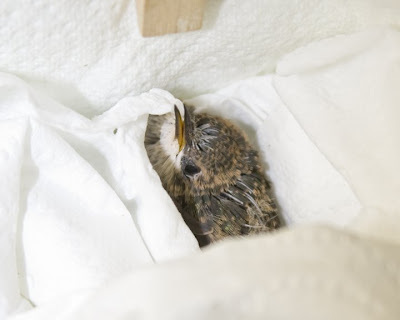 Some birds are very difficult to identify - especially when they're nestlings! 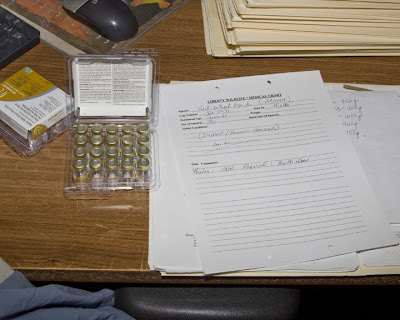 I've noticed a lot of intake forms with the species area crossed out more than once as the little creature develops and begins to become identifiable over time. Nonetheless, most gapers eat certain things, and most tubers are also given a similar diet, so orphans always get the right food. Remember "I can name that tune in four notes!"? 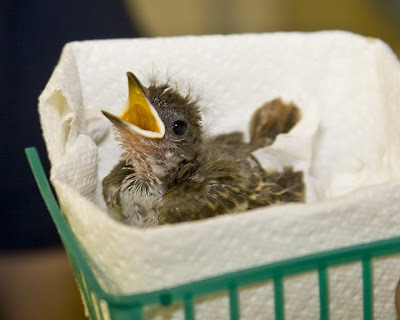 Well, at Liberty, it's "I can name that baby bird in three - weeks!" 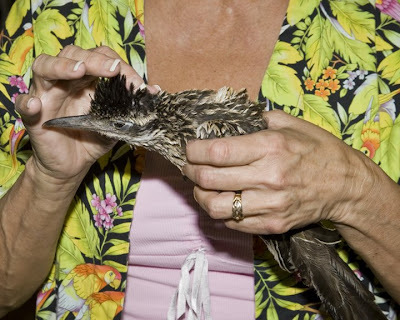 A very young road runner is brought in. Arlene examines a young RR. A young road runner was accepted early last week, and will someday join the others we have prior to being released. 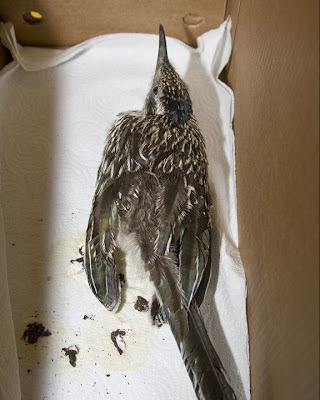 This one, however, is presenting symptoms of a contagious disease that will need to be dealt with before he can be in contact with other birds - of any species. Even the relatively cool weather can't keep the drought from causing increased instances of canker and pox from spreading as birds share water supplies. 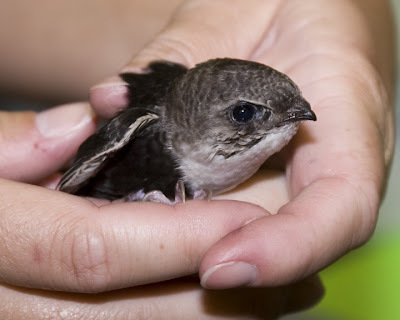 Swifts are very cool birds that are fun to watch...if you are fast enough to spot one! They live in colonies in nests held together with saliva and true to their name, are very fast fliers. This little guy came in last week with unspecified injuries. He will be carefully evaluated and treated for anything that might be found. 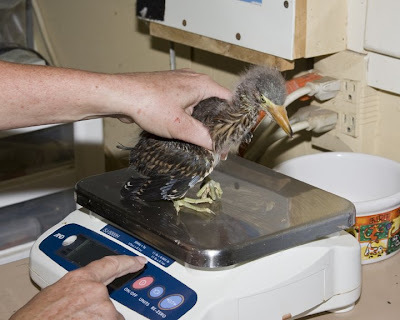 Another baby green heron gets weighed. It's a tough life when you start off with a broken wing. 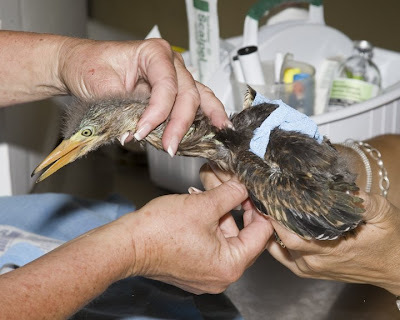 Another little baby green heron arrived this week. Not only was he an orphan, but he also had a broken humerus. Luckily, young bones mend well and fast, but still, that's a lousy way to enter the world, especially when you're as "attractive" as baby herons are...! 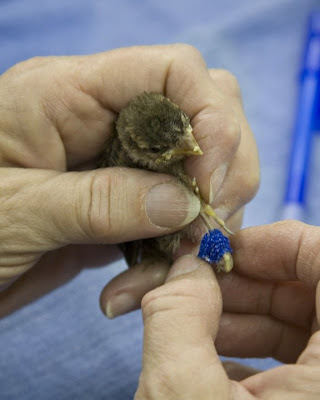 It's a lot of work to inoculate all of our birds. Cassie gets a little "beak-o-plasty"
Hogan gets her talons trimmed. 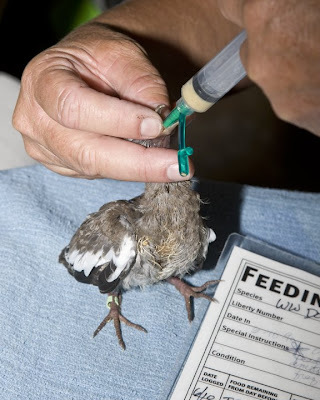 Once a year, we give all of our education birds an injection of West Nile Virus vaccine. 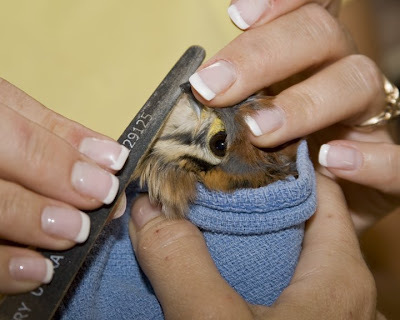 This is a time consuming process as we treat almost sixty birds, usually in one day. 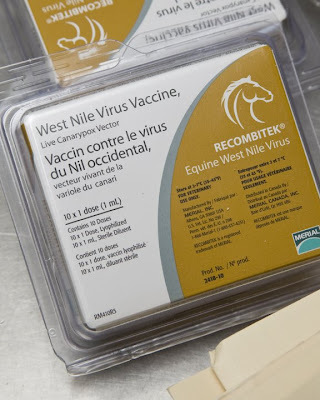 We know WNV is present in Arizona, and since it's impossible to screen out all possible means of transmission, this inoculation is absolutely essential for the health of our birds. 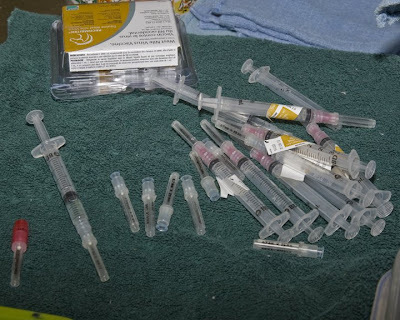 The vaccine is also quite expensive and we are forever grateful to Naomi for procuring the donated supplies as well as the company who donates it (even though they wish to remain anonymous). 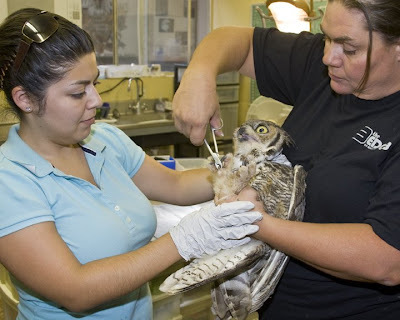 As long as the birds are taken in for inoculation, we also do periodic maintenance including talon trimming and beak shaping that must be done every so often. Good to go for another year! OK, if you didn't know it, kestrels have two behaviors that are if not unique to kestrels, then at least indicative of the species: head bobbing, and tail dipping. Why do they do it? No one really knows, but they all seem to do it. Last week I got some footage of Veto, the latest addition to our Kestrel Krew, that just begged to be set to music. I offer to you, strictly for your amusement, Veto's Final Jeopardy! Terry, as always, your creativity never ceases to amaze me! I loved the music you chose to go with the video. How in the world did you think of that?!! Hilarious! I love his "Kestrelism." Terry, if ever I need a smile to start my day this is the video to watch. You have outdone yourself (and that takes some doing) ! !